Public transit advocates in metro Detroit bolster their case for an upgraded system with its success in a city very similar to Detroit, with declining population, a readjusting economy and a fiercely loyal residential cohort pulling for its success – Cleveland. Once a center of blue-collar prosperity and Ohio’s largest city, Cleveland slipped behind Columbus in population decades ago, although, like Metro Detroit, the seven-county Cleveland region remains a vital economic center for the state and home to 2.8 million people. And, also like Detroit, the central city has seen a rebirth of sorts, with sports, arts and the Rock and Roll Hall of Fame drawing not just tourists but Clevelanders wanting to live and work in the heart of it. But at the turn of the century, the link between the central city’s largest employment centers – downtown and University Circle, five miles apart – was a standard city bus line down Euclid Avenue, the city’s equivalent of Detroit’s Woodward. Service was good enough, said Joe Calabrese, executive director of the Cleveland Regional Transit Authority, but it wasn’t attracting the “choice rider,” the white-collar worker with other options. Economic development along the Euclid corridor was stagnant, “a depressing situation,” Calabrese calls it. When he arrived from New York City in 2000, Calabrese wasn’t taking over a system in the same shape as Metro Detroit’s. The Cleveland region supports its public transit with a 1 percent sales tax, and rail commuting was well-established there. But Euclid needed improvements that new buses alone couldn’t accomplish. And new light rail was prohibitively expensive. Former Gov. George Voinovich had seen bus rapid transit on a trip to Brazil. He wondered if it could work in his hometown. As it turned out, it could. The BRT line that was constructed beginning in 2005 opened three years later, at a total cost of $200 million, about half provided by the federal government. Today, Calabrese said, it boasts the highest return on investment for any public transit project in the country – $114 for every dollar spent. More coverage: After decades of failure, will Metro Detroit pass mass transit this year? Calabrese ticks them off: The BRT was given its own lane, in the center of Euclid Avenue. The buses themselves, 63 feet long and articulated in the middle to bend around corners, have a capacity of 100 riders. They stop at 36 newly built stations, which replaced 108 existing stops. The stations are raised platforms, and the buses dock precisely, so when the multiple sliding doors – on both sides – open, riders walk (or, if they’re wheelchair-dependent, roll) right on, similar to a subway or light-rail car. What’s more, passengers pay their fare offboard, at a kiosk or online, so there’s no lineup fumbling for change at a fare box. Once the bus gets under way, it travels in sync with traffic signals, so no waiting at lights, either. The various efficiencies add up, Calabrese said. Travel time between Public Square and University Circle, the ends of the route, dropped from 40 minutes to 28. Riders entering a station can look at a lighted display to know when the next train was arriving. The experience is supported by smartphone mobile apps. Commuters liked it enough to push ridership up 48 percent the first year, and it’s been climbing by 5 percent every year since, Calabrese said. The train, originally to be named the Silver Line, was christened the HealthLine, for the two hospitals along the way that bought naming rights. 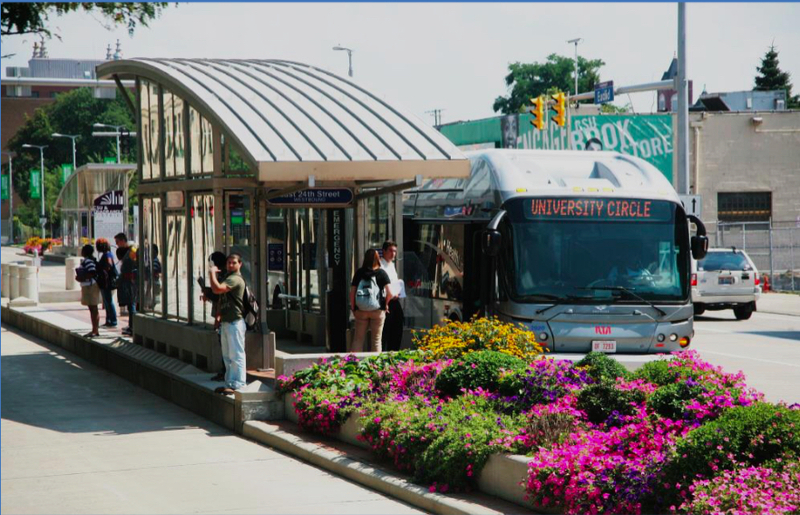 But it’s what happened along the route that really distinguishes Cleveland’s BRT. Crain’s Cleveland Business called the HealthLine the catalyst for the economic rebirth of the Euclid corridor, with $6 billion in real estate investment. The pro-public transit Institute for Transportation & Development Policy ranked the HealthLine the highest-quality corridor in the U.S. and Canada. A spokeswoman for the Cleveland Clinic, one of the hospitals that bought naming rights, called it a vital link for both employees and patients. Calabrese said he’d advise advocates for better public transit, including BRT, in southeast Michigan to make sure support for any project here is deep and wide. “What made this work is support at every level, which is not easy to do,” he said. In Cleveland, businesses wanted BRT because of what they hoped it would do for their investments. They lobbied elected officials. And there were well over 100 public hearings, not all uniformly enthusiastic about the new hybrid. But in the end, Calabrese said the HealthLine was a no-losers project; even cyclists got new bike lanes when the street was reconfigured for the center transit lane. He calls BRT “light rail on different wheels” because of the enhanced user experience, but without the enormous infrastructure investment of rail lines. What impact has the Health Line bus service had on patronage on the light and heavy rail lines that also operate in Cleveland? Doesn't the east side heavy rail line also transport passengers from downtown Cleveland to the medical facilities on the east side? Interesting question, Ren, and the answer is, I'm not sure. The system map would suggest the Health Line and Red Line run parallel to one another, a few blocks apart. Just guessing here, but maybe they serve different riderships? Calabrese was clear that the RTA's intent was to improve Euclid Avenue service in general, not just the hubs on either end. This is definitely part of it. Also: - The Health Line cuts directly through the Cleveland Clinic campus, whereas you'd have to walk a few blocks from either of the closest train stops which could add 10 minutes roundtrip. - The rail hub is Tower City Center in the "heart" of downtown, but residences and offices are spread pretty evenly over several blocks, so it's potentially much faster to get to a bus stop than the train. - I suspect a lot of Cleveland State students use it to get to nightlife/dining in University Circle. CSU is right on the Health Line, so again it's much much faster than getting to the train. Likewise for Case Western Reserve University students heading from University Circle to downtown. ROI... return on investment... lordy what a ridiculous phrase to use when it comes to public services that serve "the public good" - the investment in helping people get to work or places of business or doctors visits or public schools and colleges or tourists and visitors is borne out by the fact people can accomplish all of that and more without have to own or rent a private vehicle because they are beyond their means or such ownership is otherwise simply impractical. Sometimes - no, very nearly always - there is no profit in providing public services because it is simply what living and working in society is all about as part and parcel of our collective responsibility for one another. Simply untrue on all.accounts. The distance between University circle and downtown is less than 6 miles. The old bus was faster. Average speed on healthline is less than 15 mph. And it's scary... Marijuana usage not uncommon. Fair evasion is common... Enforcement stopped when to many.African American youth were apprehended... Was deemed racism. Odd to read this boosterish account the day after reading a different one on the well-respected Streetsblog Network that relates serious troubles for the Cleveland transit system. http://www.streetsblog.net/2016/02/25/death-by-a-thousand-cuts-sprawl-st... It quotes the same manager (Joe Calabrese) and reviews the same RTA. "A bad economy, an unfriendly state government and a steady trickle of Cleveland sprawl are killing the system" It seems revenue is down and fare increases are in the offing. The Streetsblog piece does not mention the BRT line, which after all is only one corridor in a large metropolitan area. Perhaps this is one of those examples of "the operation was a success but the patient died". It may represent the conflict between investing in a high-capacity corridor for commuters and a networked metropolitan bus system that serves those who need transit for their daily lives.